Yes, you read that right – Duvel on tap. Not the familiar 8.5% alcohol stuff in the stubby bottle, mind you, but a whole new beer entirely, to be known as Duvel Green. This gets complicated, so please try and bear with me here. Making its debut tonight at Monk’s Cafe in Philadelphia, and then again at the Beer Advocate Belgian Beer Fest in Boston this Saturday, and finally in general distribution in New York City in October, Duvel Green is a 6.8% golden ale said to be a bit paler than regular Duvel, obviously a bit weaker, and also less carbonated. 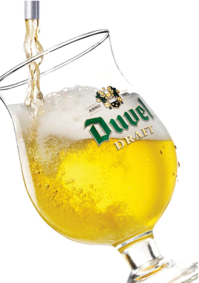 It is not Duvel on draft nor is it intended to mimic either regular Duvel or the low alcohol Duvel Green available in Belgium. It is an entirely new creation. After New York, the roll out is expected to reach Boston, DC and Philadelphia, likely in early ’09. I’ve no timetable for it, but apparently Duvel Green will also be hitting the U.K. sometime soon. Duvel Draft is being featured during Syracuse beer Week. There is an event at the Blue Tusk on Friday, November 7th!